What a little muscle man is River Gum! He was born looking like he had been 'working out' for months. River is a perfect combination of the defined muscle of a body-builder and the lightness of step of a ballet dancer. He is as agile as a cat. River is full of confidence in his own ability to conquer the world. 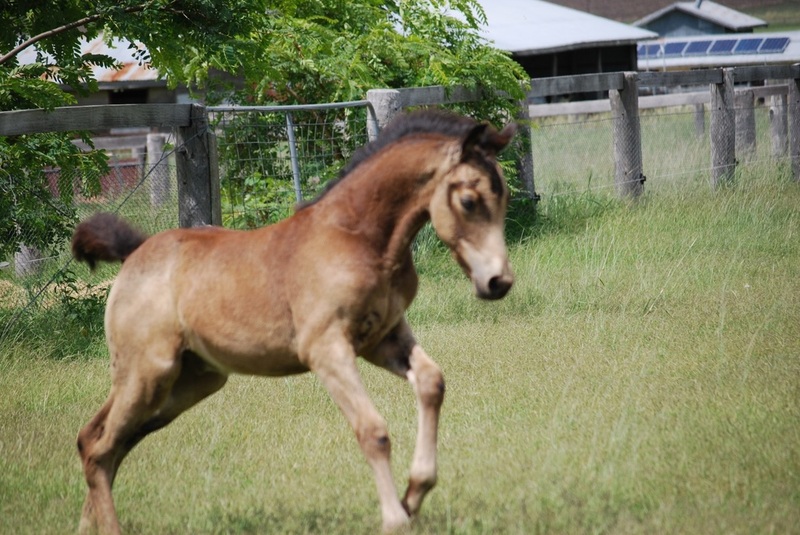 He loves to gallop and prance. He is an athlete. River is the first of this cross, so we have no comparison to make with older siblings. However, we think he will mature at around 14'3hh. 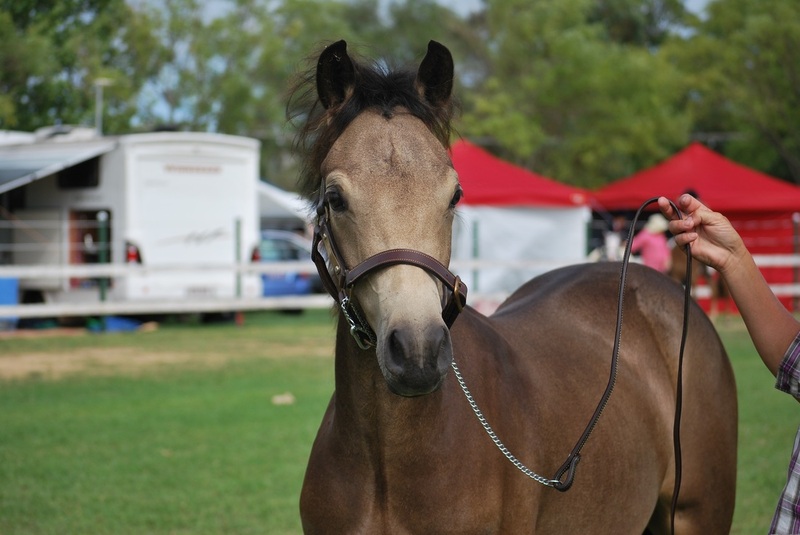 We feel it is important to maintain the Ragtime Oro Blanco bloodlines in Australia and this young fellow has grown into such a nice young fellow, we believe he is suitable to remain entire. The River Gum is a familiar and iconic tree seen along many watercourses right across inland Australia. The tree produces welcome shade in the extreme temperatures of central Australia, and plays an important role in stabilizing river banks. Along ephemeral creeks in arid central Australia it forms narrow corridors, providing vital refuge in the form of habitat and food resources for a whole host of animals in an otherwise hostile, arid environment. The River Gum is an icon of arid central Australia, where the tree is sacred - standing for water, life and hope. 'Brikki VP' is the result of a long standing dream. From the moment I first read about Funquest Erick in The Morgan Horse magazine, I wanted a son by him. It was a burning desire that was kept alive for over 15 years. I'd get close and some quirk of fate would appear and the opportunity would go in a puff of smoke. During that time, I 'met' MaryAnn Schafer through the Sport Morgan Association. We 'talked' for years via different online chat lists. 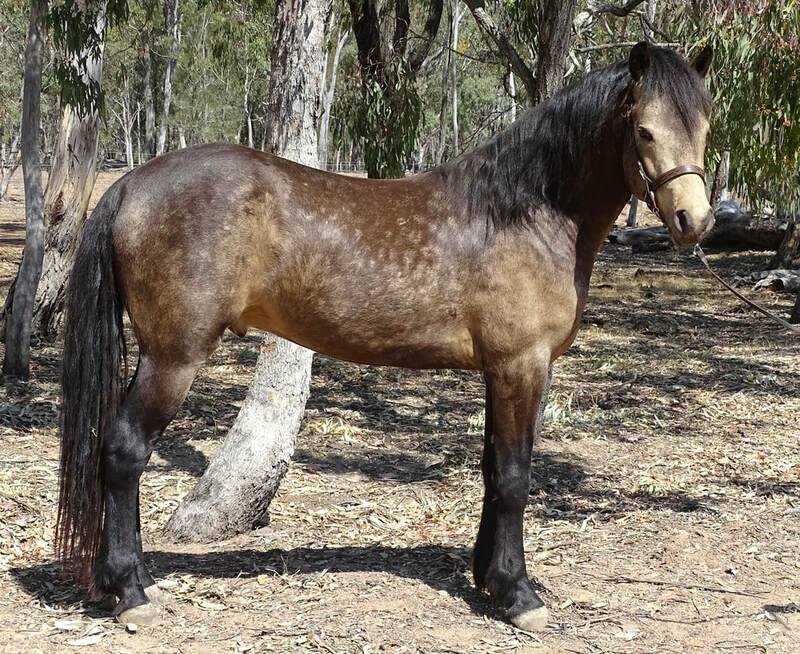 When my last 'opportunity' to acquire an Erick son disappeared, MaryAnn emailed me with the offer to lease her Erick daughter - Fox Brush Custom Design (Rikki) - for a breeding. Rikki was the result of crossing MaryAnn's Bowood Elusiv Dream mare with Erick. Both horses were Sport Horse Award Achievers and both dual registered and classified as American Warmbloods. "Erick's test scores of 83% earned him the Gold Medal as well as 5th highest scoring Warmblood stallion tested in the United States". Dream was the first mare to win the Sport Horse Award and Erick the second stallion. There are only 9 such Morgans in history. Rikki is dual registered in her own right. She is both a purebred Morgan and a American Warmblood. Rik's sport horse bloodlines are very rare indeed. To earn the Morgan Sport Horse Award, Erick and Dream had to compete in Open Competition against all breeds in five disciplines and achieve high levels of success. I still choke up with emotion when I remember that day. Such an amazing offer. As soon as Maryann made the offer to lease her beautiful mare to me, I knew which stallion I was going to breed her to. I selected PKR Primavera Brio. Brio is the son of the legendary Primavera Valdez and Rose Hill Lapapillon, one of the best mares Valdez covered. All her progeny were futurity winners and competitive on a National (USA) level. Valdez is the first Morgan to hold a Stallion Certificate in the National Reining Horse Association Sire and Dam program.